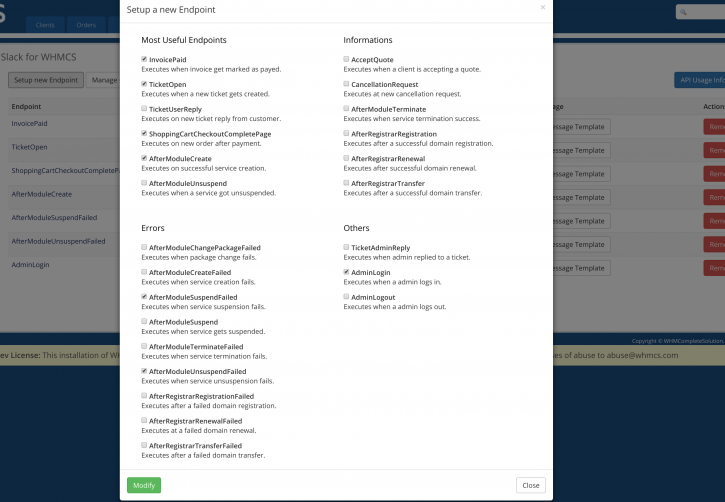 Get notifications for more than 20 events. Enable / disable notifications individually. Notifications can be posted to multiple channels or persons. HTTP Based API for your own messaging service. Easy PHP function to send slack messages from your own modules. Function is globally available in your WHMCS installation. 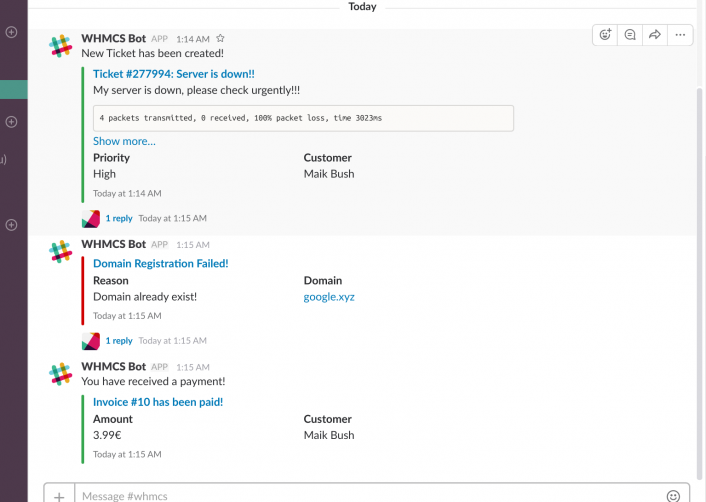 WHMCS v6 and v7 support. PHP 5 and PHP 7 support. It is useful when you always know what happens in your system. With the Slack for WHMCS module you dont need to refresh the page every 15 minutes to see that there is a ticket waiting for reply. Now you get instantly notified if something happens on your system. You can choose on which events you get alerts, also you can post messages to different and multiple channels or persons. Unlike other modules, this module does not post the message directly to slack. It does maintain a message queue. Why a message queue is useful? Because if you send messages directly to Slack, there will be a small delay at the page load time for the customer. Your WHMCS Installation will wait until Slack processed your request. 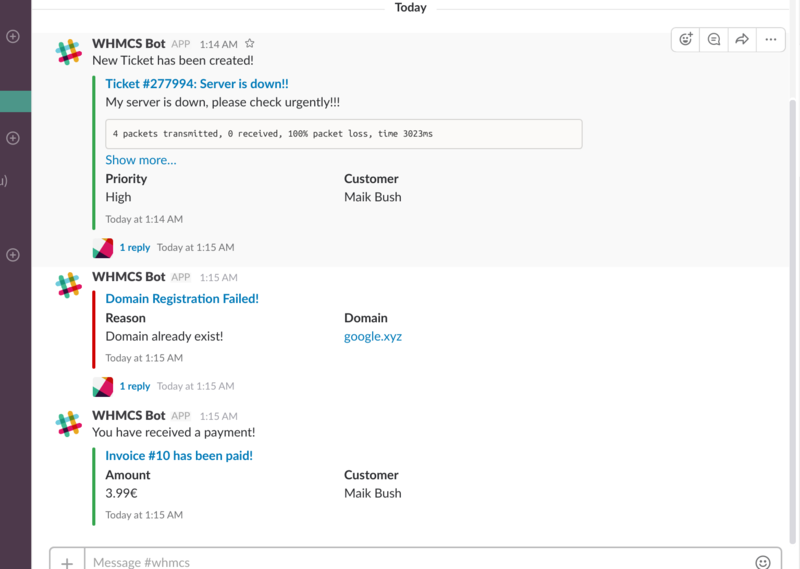 Much worse it goes if the slack service is not reachable from your server or the request times out. Then your clients will have a long page load time delay until the API request time outs. But you dont need to care about such cases with this module! With this module you get your own sending API. You can send messages from your own scripts to the slack channels and also can integrate external services with your own, easy to use, HTTP based API. The HTTP based API can be useful if you want to integrate an external monitoring service (like Zabbix or Nagios) into slack. Very well designed app. The configuration layout is very customizable, yet intuitive at the same time. This is something you don't see much these days. I was able to setup multiple notification groups that go to different channels with ease such as tickets to #support and invoice paid to #billing. Very nice. Also, I was able to customize how the messages looked. My reason for purchasing this product over the other ones was the queuing option. I can't stress how important this is. I have many slack integrations, and one thing I have learned is slack endpoints are unreliable and will go down for no reason without any warning. Setup was easy and well documented. I had a minor problem with getting API to work, but the support was very helpful. Highly recommended app.